Black Chinese button with Tassel Large circular embellishment with tassel, Rayon Art deco design Tassel embellishment with tassel, Rayon. 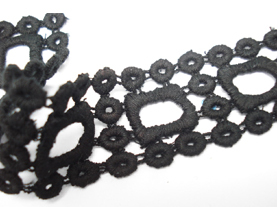 Symmetrical looped triangular frogging embellishment, black rayon Long V looped frogging Rayon embellishment, great front piece. 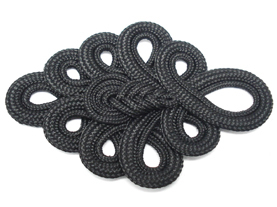 Two tone Rayon Black Rayon Frogging Embellishment, All Loops in a V shape. 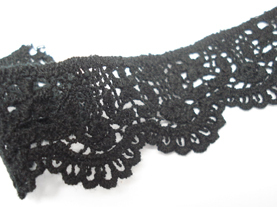 100% black cotton Openwork , scalloped Crochet tape, beautiful! Gorgeous crochet work of art! Pic says it all! 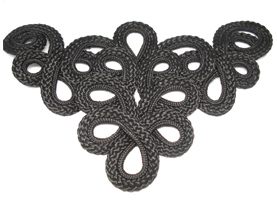 Great edging details for a garment! 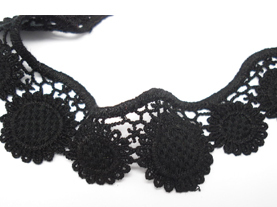 100%Cotton;Crochet Lace, open work circles and square pattern.